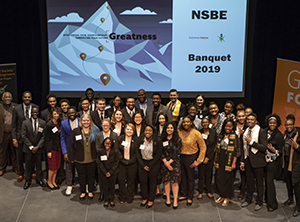 Indiana Tech’s chapter of the National Society of Black Engineers (NSBE) returned from the March 27-30 NSBE Annual Conference with several significant honors. As an organization, Indiana Tech’s NSBE chapter was named National Chapter of the Year for Retention and was recognized for having the Most Improved GPA in Region IV, which is comprised of schools from Indiana, Illinois, Michigan, Minnesota, Ohio and Wisconsin. In addition, current chapter president, Cameron Owens, and current vice president, Cierra Gates, ran for and earned regional board positions. The process required that they deliver election platforms to the entire region, which included demanding question-and-answer sessions. Both students represented successfully, as Owens was named Regional Finance Chair and Gates was named Regional Membership Chair.